Prysm has unveiled the Prysm Laser Phosphor Display (LPD) 6K Series. These interactive, large-format, single-panel displays represent a significant improvement over the company’s previous technology, with panoramic images uninterrupted by seams or bezels. The displays are shatter-resistant, flexible, and can even be rolled up for transport. The LPD 6K is available in two sizes—135 inches and 190 inches—and can display content in both 4K and 6K resolution. Initially created as a means to work in tandem with Prysm software, the screen is compatible with the Prysm digital workplace platform for interactive operation. The LPD screen is touted to use 20 percent less energy than the standard LCD screen, making it extremely energy efficient; according to the company, its power consumption similar to a commercial coffee maker. The screen itself does not require a separate cooling system and 96 percent of materials used in the production of the screen are recyclable. With a contrast ratio of 80,000 to 1, the LPD features a wide color gamut and is Rec. 709 compliant, for a better reproduction of a wider range of colors. The screen’s 178-degree viewing angle makes it possible to have several spectators viewing the screen from varying angles and positions. “Theres not a bad view in the house,” Grap said. 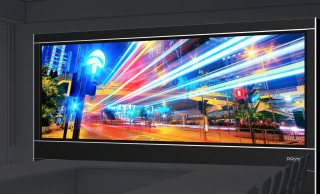 Prysm first introduced LPD technology in 2010, and its screens have been successfully deployed as digital signage solutions in retail stores, consulting firms, and medical manufacturing innovation centers seeking to implement an interactive and innovative experience for clientele and employees. The LPD 6K Series is positioned to deliver enhanced performance to these sectors, as well as reach into new markets. Overall, Prysm believes the versatility and efficiency of the LPD 6K will make it a viable alternative to competing large-format alternatives on the market. The LPD 6K is currently in general availability and shipping to partners and customers.